This post shows how to adapt a VMWARE OVA exported from Virtual BOX for a Virtual Machine, compatible with ESXi. Open the *.mf file which contains the SHA1 hash of *.ovf file. So you need to replace the value specified by the new SHA1 hash of .ovf file. Then save again OVF file. Remember that every time you save the ovf file, and you what to try to import into ESXi, you must generate the hash, replace the hash in the .mf file, follow the steps above. 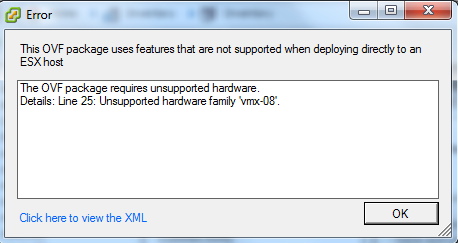 Now, you can deploy directly the new OVF file on ESXi. The following WARNINGS are raised but you can move forward. So now you can deploy and start your VM.